So, if you live somewhere like northern Utah where it seems like winter is eternal then I'm sure you can totally relate to how I'm feeling right about now. Come February I am so very ready for some warmer weather and just for the freshness of spring to start because like I said, winter here seems to drag on and on once mid January hits. It seems colder than December to me, the air quality is terrible, it's hard to find activities to keep me and my little guy occupied during the day, it's just a stagnant time. While there are a lot of cons to this time of year, there are some pros for me too. The part that keeps me going is that we still get to wear our cozy flannels and coats and layers and really that is my favorite part about living in a place with such different seasons. My husband is way more in to the warmer times of the year and I know he would rather live somewhere where winter is almost nonexistent but since we aren't planning on leaving this area anytime soon, he likes to keep warm in nice flannels and boots and he looks good (although he isn't a huge fan of being photographed so you get some good arm shots and that's about it) so I won't complain! He is a big fan of unique watches as well so he was pretty excited about the new JORD wood watch that he recently received. He loves the way it looks with his flannels and that he can easily dress it up or down depending on his mood and the weather. Seriously this watch is beautiful and I really can't believe it's made out of wood. The quality is amazing and it arrived in a gorgeous wood box so you can store it and keep it clean. Although this watch arrived for him, I might have to sneak it into an outfit or two of mine as well. I think it's a perfect men's watch and also looks great as a women's watch! I'm all about those transitional pieces. Good news! I've teamed up with JORD to do a giveaway! One lucky winner will win a $100 credit to put towards a watch of their choice and more good news, everyone else who enters will get a $25 credit to put towards a watch as well! The giveaway will close on 2/19 at 11:59 PM. Click the link below to enter! Hey there! Happy 2017! I'm a few weeks late, I know, but better late than never, right? Welp, in case you haven't been follow along with me on my Instagram (which you should if you aren't so follow HERE! ), I'll catch you up real fast! 2017 is going to be pretty exciting and busy for us because we will be welcoming a little girl into our family in April! I am already 28 weeks and into my third trimester and it is crazy how fast this pregnancy is flying by for me. I think it has something to do with the fact that I chase a toddler around all day so my days already fly by but I'm not complaining! We are very excited and glad it's flying by! I've learned a lot since my first baby and I will be committing a post to my second time around must have baby registry here in the coming weeks and I'm sure it will be so different from the one I posted when I was pregnant with my son but I'll get working on that and get it up soon! But for now I wanted to share some fun (early) impromtu maternity pictures my amazing Instagram husband took for me this weekend when we were up in the mountains trying to get out of the smog here in the valley. I love the snowy mountains here in Utah during the winter, they are so pretty! I'm grateful we live so close and are able to travel up frequently to get away and get out of the pollution even just for a few hours. It's kind of crazy too how much faster my belly has grown this time around, I am actually kind of nervous to see how much bigger it gets considering I still have three months left! But that is why I've been loving this flowy dress from My Sister's Closet Boutique because it's been able to keep up with my growing belly and still stays at a good length for me plus its super cute for when I'm not pregnant as well! They aren't a maternity shop but they have so many trendy pieces that will work for if you are (because, lets be honest, cute and affordable maternity clothes are kind of hard to find, for me at least) and if you aren't, you definitely need to head over and check them out! They are great and so kind and helpful plus I have a little discount code for you! Use code ARROWSAPRICOTS and get 10% off your entire purchase! Can't go wrong with saving money, am I right? I hope you have a lovely week! I'll see you again here soon! Hey there! I know what you're thinking, Thanksgiving is in TWO DAYS! Christmas will be here in 4 short weeks! AH!!! Don't panic though, you can do this! Although this time of year is outrageously busy for a lot of us, don't fret and make the most of this fun time with your families! Start some traditions! This is such a fun time of year and it's hard not to let it become overwhelming and stressful but always remember what's the most important thing, family! I also want to admit that I've had our tree up since the beginning of November. I might be a little excited especially since Nixon is way more into it this year so I just want to show him all of the fun and magic of the season. Don't worry though, we don't forget about Thanksgiving! Growing up, my house was always fully decorated for Christmas for Thanksgiving dinner so it's not even weird to me at all. Plus, I need more than a month to enjoy that tree, I mean, come on! So, we couldn't wait and we decided to surprise Nixon with a bit of an early gift (then we'll probably hide it and regift it to him for Christmas, that's not mean right? haha) thanks to smarTrike and he loves it! It's the smarTrike 3-in-1 Activity Center Trampoline from Toys R Us and it adjusts into three age appropriate activities(pictured below) to keep your little ones active. Nixon is 15 months now so he's been enjoying the ball pit and he loves it! He is able to climb in and out of it on his own and play with it as he pleases. The only thing is that I don't think it comes with quite enough of the balls though so I would recommend buying some more if this is something you're grabbing for your little ones this year but Nixon didn't seem to mind! He just brought a bunch of his toys in there with him! He's not quite big enough for the trampoline part of this yet but I can't even wait for him to experience that! I know he'll love it! Ball pit for ages 12 months and up. Nixon loves it! For 2 years and up you can flip it over and it turns into a trampoline with a handle bar to help keep them steady and safe while they're bouncing away! It will help develop balance and keep them active even if you're stuck inside during a cold winter! The third stage is for around 3 and up, and once they're confident enough you can remove the handle and it turns into a little personal trampoline! And its great because it all folds down super flat so its easy to store under your bed or in a closet without taking up a bunch of space. I hope you all have a great holiday and enjoy spending time with your families! And if you're braving the crowds this friday, be careful! It can get pretty intense out there! I'm not sure if this activity center will be on sale for Cyber Monday or this weekend but I'll watch it and let you know if it is! smarTrike 3-in-1 Activity Center Trampoline c/o smarTrike. All opinions are my own. Hey there! Long time no see! I've been busy lately with life, you know how it is. One day you realize its been like 3 months since you've posted last and you think, "what have I even been doing?!" Yeah, I don't even know haha. Oh well. I did want to make sure all of you locals to northern Utah knew about my new favorite place to treat yourself though! If you are a gel nail connoisseur or even if you aren't, you need to know about the cutest salon, Glamour Gels Nail Bar located in Sandy, Utah. I've recently started going there and seriously, their gel is magic! They have created an amazing gel that lasts for so long without chips, lifts or cracks! They even guarantee them for 3 weeks after your appointment and will fix them if they do chip crack or lift which is unheard of! I have a really embarrassing pic of my nails 6 weeks after having them done that I want you to see because, aside from the major regrowth, the gel still looks amazing and has zero chips or scratches. and it left my nails feeling so strong with is also unusual when you use gel or shellac. After 6 weeks. Yikes! But that gel held up! Right after appointment. Color is called Allure and made into a matte. I'm obsessed with them and the shape and stare at them all day. You need to go there if you are into gel nails or even if you ever get your nails done. They also offer pedicures! Go treat yourself! You'll fall in love! Fall is coming. I can feel it. It might still be ridiculously hot here in Utah but I know it's coming! That or I'm just doing some serious wishful thinking. Probably that. I say it every year, fall is my favorite and around July 5th I'm craving it. I've started adding some transitional items into my closet so that the one day fall decides to surprise us, I'll be ready for it. I'm loving this kimono from PB&J Boutique, its a little heavier than all of my other kimonos so instead of it disappearing when it gets too cold, I can keep wearing it all fall and winter long! I love the detail in the design as well, gives you options to wear it with a lot of different looks. I'm so excited to try them out! Happy Friday y'all! It's always tough getting through the week after a holiday but we did it!! Go ahead and get yourself a donut. And a friendly reminder, Monday is 7/11 so you know what that means, free slurpees from 7/11! Woot Woot! Mark your calendars! A Coke and Cherry mixed slurpee was my number one pregnancy craving in case you were wondering. Such a delight. Anywho, back to business, I am so excited because a friend of mine recently opened up an online shop called Darling Me Avenue! They've been up and running for just over a month now and it's so exciting! I can't wait to see how they grow! This shirt is from her shop and I'm not kidding when I say it has become one of my favorite shirts and that I wear it once a week, for real. It's so comfortable and the fit is perfect and I love the holes, which seems weird to say but it's true! 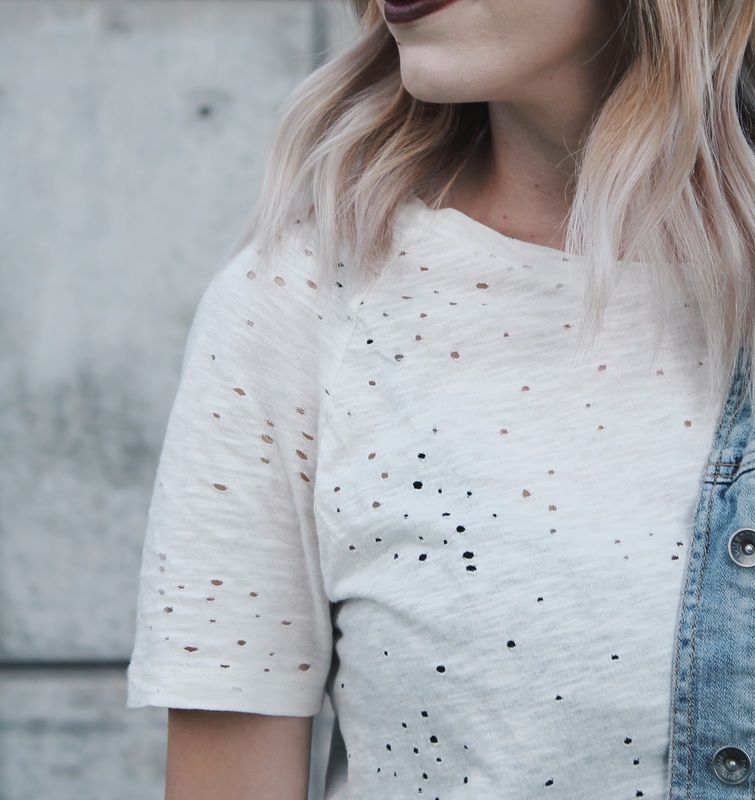 I've been looking for a cute holey shirt for a while now and when I saw this one I just knew it was right. Make sure you check out Darling Me Avenue and follow them on Instagram so you can see the new items they're adding to the shop! She has some cute stripey and floral flowy things coming soon soooooo you'll want to keep up with them to see when they release! I hope you have such a great weekend! Thanks for stopping by!